In simple terms, Alexa Traffic Rank is a rough measure of a website's popularity, compared with all of the other sites on the internet, taking into account both the number of visitors and the number of pages viewed on each visit. Alexa collects traffic data on a daily basis from millions of users who have installed the Alexa toolbar, and other sources, and then uses a complex mathematical formula on three months' worth of data to arrive at the ranking for each site. This can be interpreted as the website's position in a massive league table based on both visitor numbers and the number of pages viewed by each visitor. The 'most popular' site is given a rank of 1, the second 'most popular' a rank of 2, and so on down to the millions of websites that receive relatively few visitors. How many websites are there altogether? Probably nobody knows exactly how many websites there are at the present moment. However, in February 2016 the Netcraft Web Server Survey found well over 171 million distinct active sites, and this number appears to have remained relatively stable over the preceding eight months. What this means is that (even if we accept the probably rather conservative estimate of 171 million) a site with an Alexa Traffic Rank of less than 1,710,000 lies within the top 1% of all websites by traffic volume, according to Alexa's estimate. Of course, up till now we have been discussing worldwide rankings, but a website may be particularly popular in certain countries, and less popular in others. For example, our sister site at altered-art.net tends to be most popular in a number of countries which include the United Kingdom, the United States, Canada, Australia and New Zealand, and is able to achieve a traffic ranking in these countries considerably higher than its overall worldwide ranking. 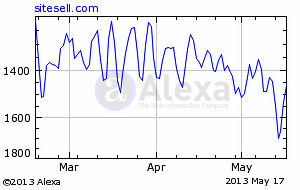 How accurate is Alexa Traffic Rank? You should bear in mind that the rankings are calculated using traffic data collected only from users who have the Alexa toolbar installed, and who may or may not be a representative sample of all those who use the internet. As a result the number of visitors to each website may not be accurately estimated, especially where that site receives relatively few visitors. In general, traffic rankings of more than 100,000 should not be considered reliable, but used as a rough guide only.